I recently met Peimbert at the magnificent Mi Pueblo Market in East Oakland, while researching an article on ethnic markets for Oakland Magazine. 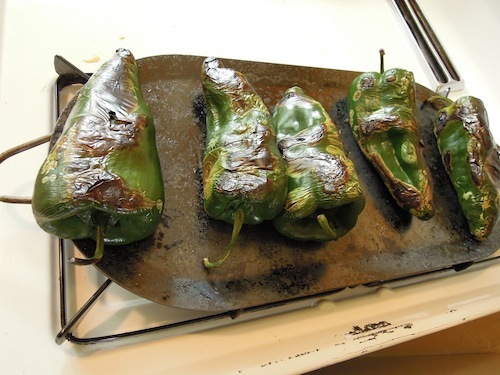 She kindly invited me over to watch her transform peppers, onions, tomatoes, cheese and eggs into delicious chiles rellenos, just like her mother used to make. Peimbert worked for over 15 years as a news reporter for Spanish-language media such as Telemundo, Univision, La Opinion, and CNN Español and is now an independent media and community-relations strategist. The attractive, dark-haired dynamo directs me to dice tomatoes for the sauce, as she sautés onions in a large pot and tells me about her life. Born in Sinaloa, Mexico, the 11th of 12 children, Peimbert has always been an independent go-getter. When she was 18, she co-produced and co-hosted a daily television program “Entre Amigas,” and was the public relations director for a youth arts organization in Mexico. But she followed her dream to California, the only child in her family to move away from Mexico. At age 22, Peimbert traveled to Los Angeles. “I was visiting and I stayed. Thank God, I didn’t have to cross the border without papers and endure being called ‘illegal’, but I did live the immigrant experience. I came to LA with no family, not speaking English, so the first three years I needed to work at whatever jobs there were [including cashier at a fast-food restaurant and salesperson at a furniture store] while I worked for free at every Spanish publication I could find. I knew I wanted to be a journalist and I earned my right to do that. I got my first job at La Opinion, a very important newspaper in LA. Now she quickly slices a disc of cheese into long spears. 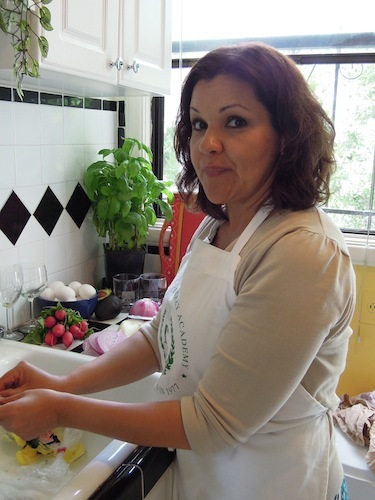 Peimbert is a ball of energy in the kitchen and the community, devoting time to working for immigrants’ rights, empowering women, improving access to education for minorities, educating Spanish-speaking voters and fostering good relationships among people from different cultures, just to name a few. 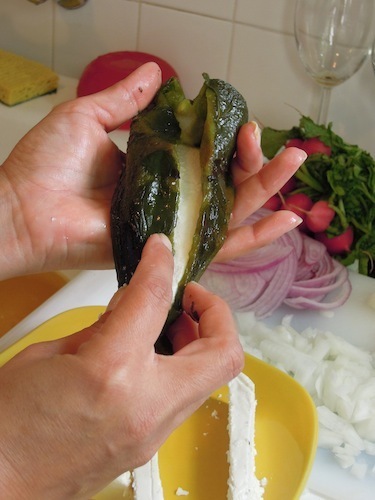 Peimbert slits the cooled peppers and carefully pulls out the seeds, stems and veins and peels off the blistered skin. “This part always makes me think of my mother,” she says with emotion. “Preparing this dish is not complicated, but it’s time consuming.” She rinses out the peppers to get every last seed. 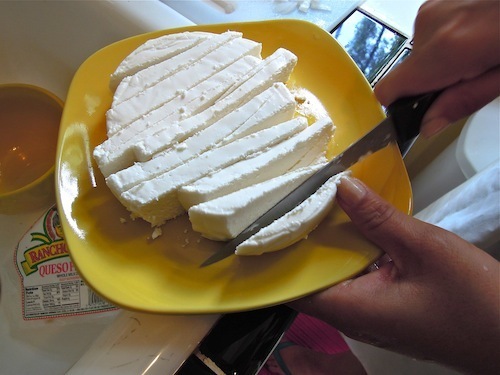 As she stuffs each pepper with a spear of cheese, Peimbert has me whip the egg whites into stiff peaks. Later, she adds just a couple of egg yolks (instead of all of them) “to make it healthier.” Each pepper is sprinkled and rubbed with a little flour (she uses gluten-free flour from the Food Mill) so that the egg coating will stick to the pepper. After Peimbert pours oil into a medium-sized frying pan, she turns up the heat. 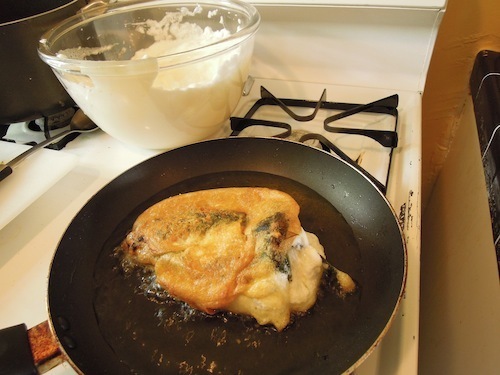 The pepper in its fluffy egg white coat is gently laid in the bubbling oil. As the first side browns, Peimbert shows me her secret: ladling a couple of spoonfuls of the hot cooking oil over the top of the pepper to begin cooking the second side. When first side turns brown, she eases the pepper over to fry the second side. It looks like a puffy golden cloud. As the pepper comes out of the frying pan, it is set to drain on paper towels. And the next one gets an egg dip and a hot oil bath. When the peppers have drained, Peimbert adds them to the pot of tomato sauce, where they will soak up even more flavor. I help by shredding lettuce that she arranges on the plates. 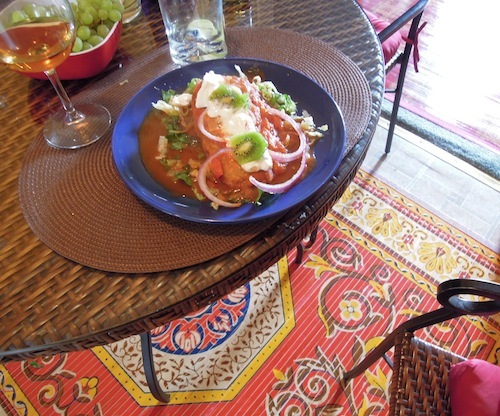 Peimbert carefully arranges a pepper on each plate, ladles on some extra sauce and tops with a dollop of sour cream. “My mom always told me that what I was doing with my life was exactly what she would have loved to do. She passed her creativity to me. I’ve always felt sad that she didn’t have more opportunities, because she was so creative, but perhaps for most women in Mexico at that time, there was no vacation, no time off.” Now Peimbert adds the finishing touch – her own innovation – slices of kiwi fruit, whose green flesh look pretty against the white sour cream. 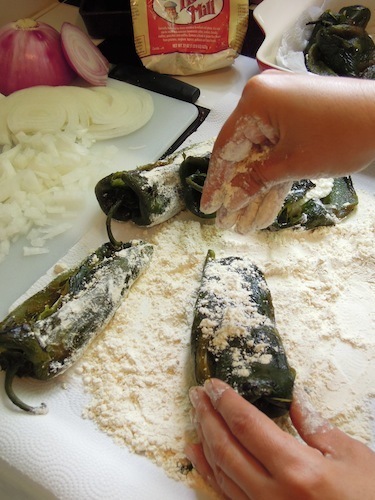 This entry was posted in gluten-free food, Immigrants' stories, Mexican food and tagged chiles rellenos, immigrants' story, Leukemia Society, Lupita Peimbert, Mi Pueblo, Team in Training. Bookmark the permalink. Wow, these look amazing. My son is growing chile peppers and has an abundance, so I am forwarding your post to him. Thanks for sharing this story. Thanks, Tara, hope he likes it. And did you notice that Lupita uses Bob’s gluten-free flour? So no problem for g/f folks. oh thank you for this! 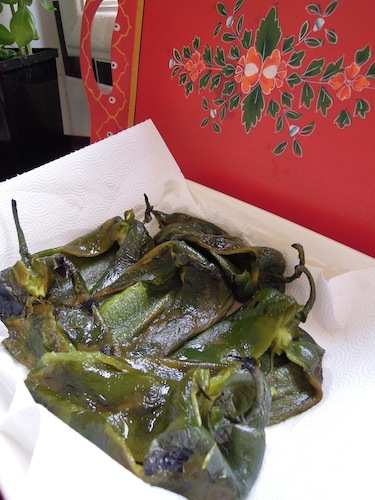 The best chile relleno I ever ate was in Temescal (Oakland)! I will definitely try this recipe.